All of Europe’s biggest cities have a traffic system that should never be traversed in an expensive supercar. France has the Place Charles de Gaulle, London has Piccadilly Circus and Italy has, well, pretty much every circulatory road in every major Italian city. Barcelona boasts the Plaça de les Glòries Catalanes. It’s a complete menagerie of commuters on Burgman scooters, van drivers with a death wish and ultra-hip fixed-gear bicyclists. It’s not a place for a supercar, but here we find ourselves. In Audi’s £130,000 drop-top R8. It’s lucky that we’re driving arguably the most forgiving 533hp performance machine on the planet, as the cossetting seats, ludicrously helpful Virtual Cockpit navigation system and reasonable visibility ensure I exit the Roundabout of Doom with nothing but a slightly sweaty brow. Muckrakers will argue that the Audi R8 has always been the sensible supercar choice, offering understated-yet-stunning styling in a package that can, as cliché as it sounds, be used everyday. But while the convertible version remains as practical as ever, it sports Audi’s beastly 5.2-litre V10, sharper exterior styling, a new range of eye-popping colours and an exhaust note that’s raucous enough to wake the dead. This car may be easy to drive but it’s not for the shy and retiring type. Its hallways and corridors may look like something from a Stanley Kubrick film but this ultra-modern building is a minute’s walk from Diagonal metro station and within 1.5 km of both the Plaça de Catalunya square and La Sagrada Família. Expect stylish rooms with flat screen TVs, expansive bathrooms and achingly cool decor, as well as a well-stocked Roca cocktail bar and night club that knowing locals frequent on the weekends. Better still, the roof top pool and hot tub are the perfect place to snap some stunning views of the city. A full concierge service allows you to pull up outside the hotel while a member of staff parks your car in a private, underground parking lot, which is accessible via a lift from the main building. The old tourist information centre at El Nacional has been transformed into a foody heaven, offering quick and easy meals that cater to all tastes. The bar is called El Quiosco and it includes breads and cakes for those in a rush but every item is made on the premises and it’s packed with flavour. Classic Catalan seafood is also available at 7 Portes, which is always busy and typically requires a reservation but serves up some amazing paella dishes. Just looking for a quick drink? Try the awesome selection of rum and tasty snacks at The Box. You can find it on the Carrer D’en Gignas. 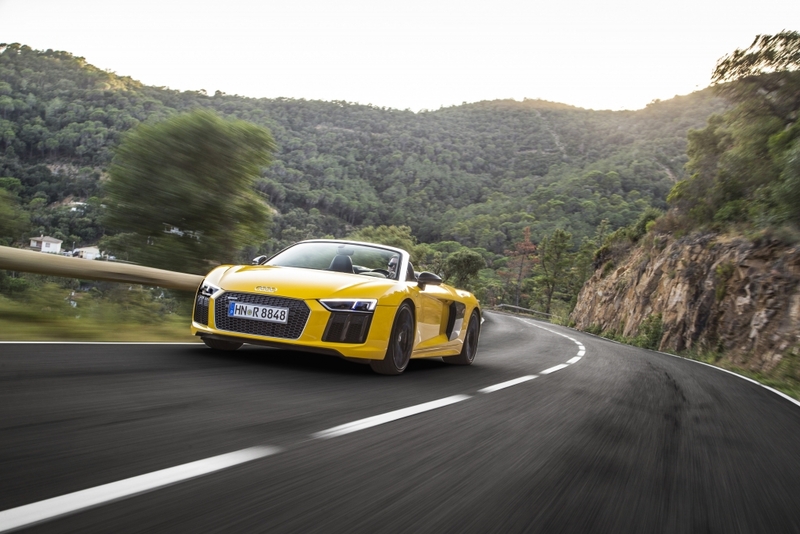 We point the Vegas Yellow R8 Spyder towards Sant Andreu de la Barca, flip Audi’s drive select system into comfort and cruise A-2 in search of quieter and slightly more challenging roads. With a naturally aspirated 5.2-litre V10 producing 533hp under the skin, it’s surprising just how adept the R8 Spyder is at munching the motorway miles. The magnetic ride damper control does a great job of ironing out imperfections, while the revised cloth roof ensures road noise is kept to a minimum. Let’s dwell on that roof for a second, because it’s a slice of engineering genius. The folding fabric contraption grants access to the Spanish sun in a mere 20 seconds. With the help of a 175-bar pump and nine electro-hydraulic actuators, it carefully raises and lowers the convertible top at speeds of up to 31mph and it weighs just 44kg. The entire car is just 125kg heavier than the coupe version upon which it is based, which just goes to show how much effort the engineering team has invested to ensure the Spyder is just as potent as its fixed-head sibling. More importantly, Audi’s new Space Frame technology, which is made from a complex weave of aluminium and carbon fibre, ensures the new car is a staggering 50 per cent stiffer than the outgoing model. In short, it’s the stiffest open-top sports car on the market and that translates into a machine that will happily gorge on corners and tear-up switchbacks until the sun sets or the fuel tank runs dry. And those switchbacks are to be found around Montserrat, where the road carves across mountainsides and deep into canyon gorges. Follow the C-16 towards Vic and you’ll be spoilt for valley walls from which to bounce the devilish exhaust note off. Straight-line performance is staggering. Nail the throttle and the 0-62mph sprint is complete in just 3.6 seconds. A top speed of 197mph is easily attainable for those with a laissez faire attitude towards the law but it is the engine and gearbox that really shine. Pull back the slender levers located behind the wheel and the buttery smooth seven-speed dual-clutch transmission thumps up and down the gears with ease. Dial in some of the more performance-related settings via the gorgeous steering wheel buttons and the driving experience becomes even more visceral, with every gear change physically punching you in the gut. And that V10 engine is simply divine. It just sounds so good and proves to be the perfect antidote to hybrid power, turbocharging and the general downsizing trend currently embraced by the auto industry. Specially designed with driving in mind, the Positano uses Photochromic, Polarization and Spectral Control Technology in its lenses and the results are genuinely impressive. Molecules inside the glass actively expand in brighter environments to create a darker lens that absorbs more light, while Spectral Control manages light wavelengths, which means haze and glare are reduced to reduce eye fatigue. The frames are light but tough, while Serengeti offers up plenty of modern and classic styles to perfectly compliment most cars and outfits. Perhaps the biggest niggle for the most ardent drivers will be a lack of steering feel. That’s not to stay it doesn’t handle well, because it does, but you can be left feeling slightly detached from what’s going on at the front wheels. However, settle down onto one of the near-empty motorways and it’s difficult not to be impressed with the sheer weight of technology offered in a car with such potent performance credentials. Audi’s awesome Virtual Cockpit, which sees a 12.3-inch TFT display replace analogue instrument binnacles, may feel like old hat to those regularly reading the tech and automotive press but it doesn’t fail to astonish. The marque’s MMI navigation plus system has been given a mild refresh here, meaning the interface is more responsive than in earlier models. Plus, microphones have been placed in the seatbelts for the best hands-free telephony experience possible, while an optional Audi smartphone interface now sees a phone box with inductive charging thrown into the well appointed dash. Arguably the most interesting news on the infotainment front is the addition of a new Bang & Olufsen sound system, which is offered as an expensive optional extra. This heavyweight, 550-watt amplifier and 13-loudspeaker system packs some seriously meaty sounds, especially when blasted out of the new head restraint-mounted speakers. According to engineers, Audi teamed up with the Fraunhofer Institute, one of the most famous R&D institutes in Germany, to create what it calls the Symphoria algorithm in order to deliver greater depth to the sound. Technical guff aside, Mura Masa’s latest album sounded great through the system. The sun begins to dip as we head for Girona and our final destination at the Hotel Alva Park but the fun doesn’t stop. The Spyder begs us to to drop a gear via the slender paddle shifters and sprint for the nearest tunnel. Barcelona’s nightlife is legendary and the nightclubs located on the beachfront are the perfect way to let off some steam. Opium is arguably one of the most famous and it boasts a brilliant atmosphere and hosts top DJs most nights. The ultra-hip tend to flock to places like the Marula Café in the stylish El Gòtic area or the Sidecar Factory Club, which is rapidly becoming the place to hang if you’re into alternative rock music or any kind. Failing that, if you’re feeling adventurous, you could take a wander around Ciutat Vella, one of the oldest neighbourhoods in Barcelona and one that’s packed with great secret spots typically tucked up an alleyway just begging to be found. Soon we’re on a fast, gently undulating motorway and the evening’s cold air has forced us to raise the roof. That doesn’t mean the aural fireworks have to stop, because Audi has installed a small rear window that can be lowered to allow the V10’s soundtrack to fill the cabin. It’s almost childish in its simplicity but it doesn’t fail to raise a smile. If you’ve got a spare £130,000 burning a hole in your pockets and a penchant for a drop-top performance machine, there is plenty of choice out there. Porsche’s 911 Turbo Cabriolet being one and Jaguar’s insane F-Type SVR Roadster being another. But here, on the beautiful roads surrounding Barcelona, the Audi R8 Spyder seems like the perfect car. Classy, refined and hugely fun, it’s the supercar you could use seven days a week, but one that will impress Monday through Sunday.